22oz brown bomber with a freshness date. Wow, without a doubt the most interesting hop forward beer I have had this year ... perhaps one of the best as well. We all know and love Citra but the Mosaic really shines here. Deschutes yet again has no problem going above and beyond when it comes to bringing on the hops. What a malty mess. Nothing but malt on the taste. I am highly upset that I hunted this down. Well within freshness range. Taste is malt, malt, and more malt. Will not seek again. Overrated garbage brew. A - Pours a crystal clear dark orange/copper with a one-finger off-white head of compact bubbles. Columns of lacing. S - Powerful tropical fruit aroma, (mango, tangerine, grapefruit), mint, pine, and caramel malt. T - Lush, juicy tropical and citrus forward (matches the fruits found in the nose but some added lemon/lime). Semi-sweet malts (buttered biscuit) come through in the mid-palate and provide a nice base for the hops to blend with. Finishes with tangerine peel and fresh mulled spearmint. Delicious. M - Outstanding "creaminess" that really helps this beer turn into something special. Medium bodied, with medium carbonation. Smooth. Not oily or "resinous" in feel. Dry, crisp finish. O - Amazing beer. Delivers the full flavor of the hops in a smooth feel without tongue peeling bitterness or astringency. Drinking it feels like you have seen the future of IPA's. My new staple. Poured into a snifter. Thanks, Darren. A: Bright gold with an off-white one-finger head that lingers down to medium sized bubbles. Thick lacing. Pretty. S: A citrus factory featuring grapefruit, mango and pineapple. T: Semi-sweet, smooth, balanced. A terrific caramel malt/grapefruit hop tango. Very low bitterness. Just got it in before the freshness date expired. M: Medium with medium/thick carbonation. Very full and rich. O: Another great reason that non-hopheads can enjoy IPA's. The balance is terrific. Recommended. Fresh Squeezed is definitely an appropriate name on this one. A very juicy, mouthwatering citrus hop bomb. Not too much malt on the back to let the hops really shine through, but still has just enough to keep them from becoming overly bitter. Very tasty, with a beautiful orange/amber red color and smooth medium mouth feel. Simply amazing. Tastes like a cross between a sweet ruby red grapefruit juice and a fine champagne. I was expecting some super bitter, mouth-puckering IPA, but it was so ridiculously well-balanced without sacrificing that lovely hop profile. Will come back to this again and again. This is not only a great IPA, but it's also the perfect gateway beer for those looking to tread into hoppier waters without the full blast of hops that some of Deschutes' other beers have. The perfect balance of hop bitterness and fruity sweetness. I myself have highly hoppy tastes, so this is on the milder end for me, but this beer never disappoints. Look: Pretty dark. Unexpectedly so considering the scent and taste. The darkness implies malts that do not stand too much, which gives the beer an incredible contrast that is present in every aspect. Smell: Lots of citrus up front, orange dominates with malts lingering in the background like the quiet kid at a party that ends up being pretty cool. Booze is actually distinguishable although it is low ABV. Taste: I actually didn't like this beer the first time i tried it, and it was on tap at a local bar in DC. I tried it again when told by a friend I should revisit, and boy am I glad I did. The hops are a constant from the first sip, but relatively tame. Orange is as present as it is in the nose, tropical fruits are present but sin in watch of its orange flavor. The beer is extremely juicy. Malt is present but refrains from ruining the style. The beer manages to have a crisp finish because of all the juiciness. This beer is really, really good. I'm glad I allowed it a comeback. Feel: Relatively thin, making the beer very drinkable. It is relatively session-able because of the ABV, which makes this a go-to when I see it available in the area, which it has been recently. Overall: A great beer that I overlooked because of some of its unconventional characteristics. Ended up being one of my recent favorites that I highly recommend to anyone who sees it around. Its like if Nugget Nectar and grapefruit sculpin had a love child. 12oz bottle poured into pint glass, best by 6/17/17. L - Copper brown body with a half finger of slightly tan, smooth, white foam. S - Deep fruity citrus notes, definitely a hint of grapefruit and clear mosaic/citrus hop presence. F - Smooth medium-thin feel that really does melt on your tongue. The carbonation seems a bit higher than most ipad giving this a slightly dry finish. O - I have been drinking this beer for years and finally put in the time to rate it. One of my favorites and I recommend this to anyone who likes IPAS or is just getting into drinking craft beer. Deschutes Brewery has been one of the US brewers I’ve been trying to get my hands on ever since I began walking... the day after having a big night out drinking American craft beer (see how important it is to finish some sentences). Anyway Deschutes, Russian River and The Alchemist are all up there in my fantasy beer world. Well no longer for Deschutes (take that brain!) as The Durham (Canberra) managed to get a few of their brews in and I went straight for the big guns: Fresh Squeezed IPA. A: Hazy deep amber body with a 2cm off-white head - smack in the middle of classic IPA territory yes. 9/10. S: Pineapple forward with citric/pine notes and hints of caramel malt. Tropical and citric hops domineering throughout this fantastic aroma! I want this in an aftershave... actually scratch that, an aftershave of this would have me salivating constantly - somehow I think ladies might get the wrong impression of me from this. 10/10. T: Wow! All of the above (pineapple, citrus/pine) the balance between hops and caramel malts is superb - a master class in how to balance sweet/bitter characters. Tropical fruit from the Mosaic hops (which are fast becoming my favourite hop) mix well with the lemon/lychee Citra flavours. Someone told me the other day that Sierra Nevada Torpedo IPA had better flavour but he was wrong - this beats it. 10/10. M: Medium bodied with a light carbonation and plenty of hop oils sloshing around (in fact you could see oil drops in the pour). 8/10. D: Verdict: My new favourite IPA. Although it’s pretty mild as far as hop bitterness in American IPAs go (it’s more like an American Pale Ale in this respect) it has such flawless balance, and the tropical/citric/pine combination I know and love. I reckon I could down a case of this quicker than a dying man in a desert. It’s 6.4% ABV and you hardly notice it. I’m having a double take here: I need to get it again just to make sure it really is this good or if I happened to have a miraculously good batch - the bottling date is August 2014 - fresh IPA at its best. 10/10. Food match: Classic IPA cuisines for me are Thai/Vietnamese/Malaysian, however I have a feeling this Ale would be just at home with a gourmet pizza too. Serving: 12 oz bottle (stamped "best by 09/13/17"), poured into a Spiegelau IPA glass. Appearance: Slightly hazy golden amber with a dense head of frothy off white foam and layers of lush lace. Smell: Clean citrus, stone fruit, caramel malt and slight dank. Taste: Juicy citrus (Meyer lemon, tangerine), slight tropical fruit, biscuits and caramel sweetness. Good hop bitterness, herbal and earthy, grapefruit rind. Mouthfeel: Medium body, lively but smooth carbonation. Overall: Nicely balanced and drinkable. Juicy citrus and caramel malt, but still enough bitterness to remind that it's an IPA. I just deleted a review of this beer based on a bottle whose "best by" date was 6 months ago. I just got a fresh one and there was a world of difference. This is a very good fresh hops IPA. Pours a reddish amber color with a big frothy off white color. Head retention is very good and there are frothy partial rings of lacing on the pint glass. Good aroma of both citrus (orange) and piney hops. Good strong flavor as well. Both piney and citrus hops. Bitterness is just right and there is a good amount of caramel malt too. Mouthfeel is medium in richness (with the caramel malt adding sweetness) and nice and crisp. There is some resinous/oiliness in the mouthfeel as well. A very good IPA!!!! Fresh explains the appeal of this brew. Near or at the pinnacle of its class. Refreshing when you don't expect it. I just love love this IPA ! I've been drinking it as my favorite for 2 years. Such a great finish , great taste , great body,great mouthfeel, super drinkable, all around balanced and enjoyable = one of the very best beers I have ever had. Then suddenly they switched from a bottle and put it in a can and it's just NOT the same. I don't know if there is a difference in the bottle conditioning process or what it is. I have done side by side taste test with expiration dates exactly the same and the cans are definitely different in mouthfeel, taste and finish. There are clumps of what appears to be yeast in the occasional can which float around in the glass. Please Deschutes put this wonderful beer back in bottles. Please. EDIT 8/27/2018 : Okay since first releasing in cans earlier this year,Deschutes has ironed out the problems with production I mentioned. 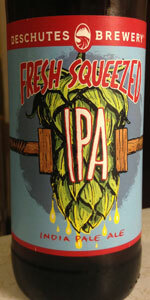 However , I have found a source for Bottled Fresh Squeezed IPA here in Austin. YaY ! )) That said, I did a side by side Bottles against Cans comparison again and the bottled version still wins,but not by as much as before. While the Bottled version is certainly better,the cans are definitely far superior to many other beers out there...... I have been redeemed Deschutes!! Thank you ! Really don't care for IPAs, and as such wouldn't have tried this beer but for the brewery's facebook page. After conversation with someone at the brewery, I told them I don't like the flavor of pine, they suggested this beer. Said hoppy, but no pine. And there it is pine flavor. Pours a clear copper/orange color with a white head. Orange, grapefruit and pine lead the nose with a malty sweetness in the background. Taste is huge citrus with more mandarin orange than grapefruit to me. A pleasing sweetness and a great bitter pine ending round it all out. This is a great fruity IPA. Really great. Misty dark orange with a full finger fluffy head that slowly and messily recedes to some moderate lacing. Bottle's old and that's really obvious from the smell. Fruity hops barely surpass the sticky caramel. Clear biscuit, faint pine, faint tropical notes. Not much here. Taste fortunately has more hop, bitter sweet citrus in the front with juicy orange, lime and pink grapefruit, followed by pineapple, faint mango juice. Lots of caramel sweetness to back those flavors up. Biscuit toastiness. Pine towards the finish, but mostly grassy bitter hop. Probably lost a big part of the piney note over time. Medium body and carbonation, smooth, pretty long finish. Hoppy aftertaste, biscuit, just a bit of fruit (still with a faint tropical hint). It was good, but it's certainly better than this when fresh. Maybe next time. Perfect example of a citrus bomb IPA. This is a great go to ipa. It is pure citrus from the aroma to the flavor. This is one of my favorite beers. I highly recommend anybody who can get it try it. Not much else to say that hasn't been written. Awesome IPA. Poured into a 13 oz Weyerbacher tulip glass best before 8/11/17. Pours a very attractive deep amber with a beautiful 2 finger sticky off white head that leaves, a thick layer of foam all over the sides of the glass. Smell is apricot, guava, pine, a hint of caramel, and grapefruit rind. Taste follows apricot, caramel, guava, pine, and grapefruit. Mouthfeel is a big medium, slightly sticky, moderate carbonation, not really dry, and incredible drinkability, but it has a ton of flavor for 6.4% ABV. Overall this is a beer I have wanted for sometime and @Lingenbrau made it happen thanks man. This is a tasty IPA.